The first pressing question upon arriving at PEV Labs in Waynesboro is obvious: Would you like to ride the Dork Pod? 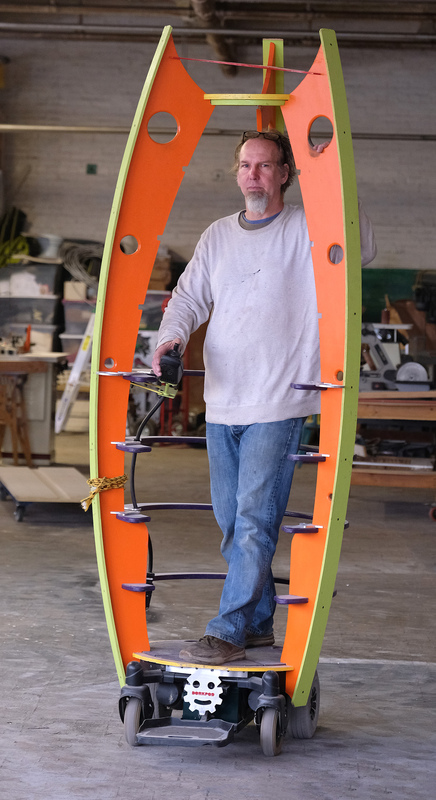 Brian Williford of PEV Labs in Waynesboro, demonstrates a vertical electric vehicle he calls a dorkpod in his shop. Photo by Norm Shafer. An inviting yet slightly terrifying brainchild of Brian Williford, the Dork Pod boasts a zero degree turning radius and one-thumb navigation controls. But it is only one of many Personal Electric Vehicles (PEVs) being developed and tested in his lab. Segway plans, electric scooters, and cargo tricycles dot his drawing boards. One of his signature projects is developing a wood-frame electric bicycle. Designed on a computer, cut by a CNC machine, and epoxied to the waterproof shine of a ship’s hull, these bikes and their electric motors allow riders to set their level of personal effort while still carrying them up hills and through town. 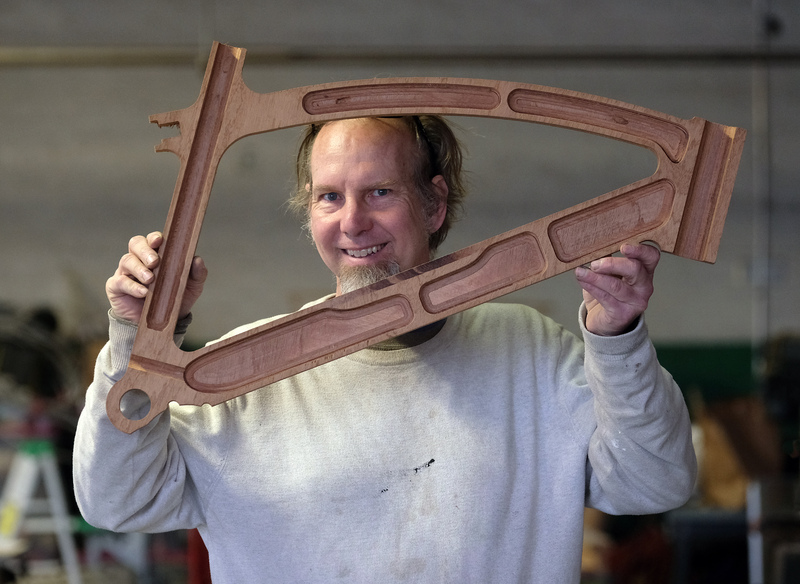 Brian Williford of PEV Labs in Waynesboro, shows off a prototype of a wooden bike frame built for an electric assist bicycle. Photo by Norm Shafer. Brian’s entrepreneurial history has moved him through the upper echelons of computer-based website and application development, serving as the lead site developer for National Geographic in the 1990s when they were launching the first database-driven website and designing Apps for Apple during much of the past decade. It’s also landed him in roles in auto repair, electronic music, and carpentry. 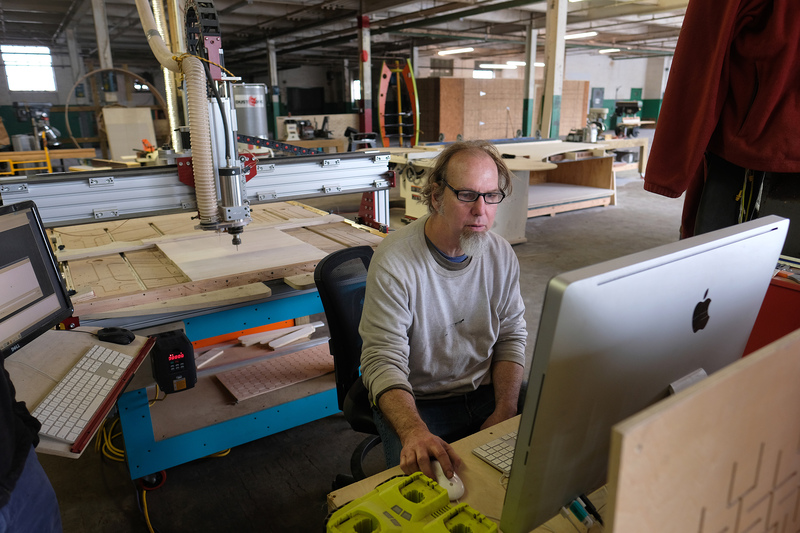 Brian Williford works on a design at his PEV Labs in Waynesboro, Friday April 27, 2018. (Photo by Norm Shafer). 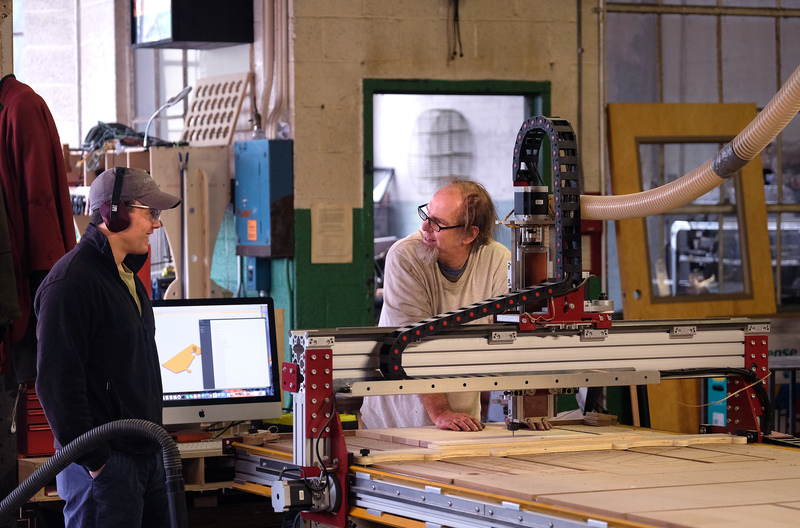 Nathan Semiao of Blackbear Furniture and Cabinets and Brian Williford of PEV Labs talk as a computer guided saw that Williford built cuts out puzzle pieces for a dresser that Semiao was going to build. Photo by Norm Shafer. 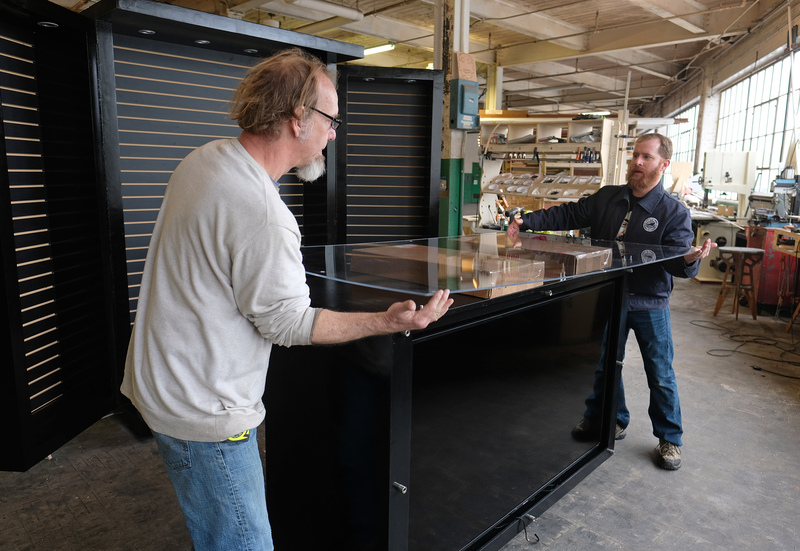 Brian Williford of Pev Labs helps Jason King move a glass top on a display case that King had Williford build for a DJ in Las Vegas, Nevada. Photo by Norm Shafer. To Learn More about PEV Labs, check out their website at http://pevlabs.com To learn more about the entrepreneurs and innovators who are building the Waynesboro local economy, check back at www.growwaynesboro.com/meet-them for ongoing profiles and small business stories. ← Back to the Basics: brewing beer and sharing history with Basic City Beer Co.